This week's tablehopper: yum cha-cha-cha. The start to an elegant lunch at Yan Toh Heen at InterContinental Hong Kong, complete with an eye-popping jade place setting. Photo: © tablehopper.com. Hi there! I am back from Hong Kong, a place that completely rocked my world on so many fronts. I had the best dim sum of my life (trust, I ate ALL the dumplings), the best jook, learned so much about Cantonese cuisine, and I was blown away with the level of hospitality and kindness I encountered (and not just in the high-end establishments I went to). For someone who really values good manners, I was in heaven in Hong Kong—I encountered so many levels of politeness, an incredible feat in a place with such population density. I loved the efficiency of so many things too—the underground was awesome. The three hotels I stayed in (Upper House, Mandarin Oriental, and InterContinental Hong Kong) were each fabulous in their own unique way. I know, I was so spoiled on this trip! I’m editing my 2,000 photos right now, stand by for my recap soon. In the meantime, you can catch up on my tablehopper Instagram or Facebook page if you’re curious! Warning: don’t look if you’re at all hungry. Meanwhile, I am back and in fifth gear. Early this Saturday evening, I’m hosting that tablehopper cocktail crawl I alluded to before I left! We’ll be hitting three bars in North Beach, featuring spirits from Anchor Distilling Company’s portfolio, and there will be heavy apps too. Don’t want anyone to go hungry, not on my watch! Space and tickets (available on Sosh) are limited, and for $65, it’s pretty much a total steal for such a Barbary Coast bash. Hope to see you Saturday! It’s gonna be quality! And fun, duh. This week we have a bunch of news to catch up on, and I can’t believe how many more new openings are happening. Bizzeee. We ran an in-depth piece on Liholiho Yacht Club before I left, but wanted to be sure you saw their hunger-inducing menu, now live on their website. I also wrote this post for Refinery 29 on the most anticipated openings of 2015 (so far), hopefully it can help you keep track of everything. Fortunately I also wrote this piece for 7x7.com on seven new cafés in town, in case you need an extra boost. I sure did the past few days, although let me tell you, flying Cathay Pacific will have you feeling fresher on arrival than any other airline I have flown. 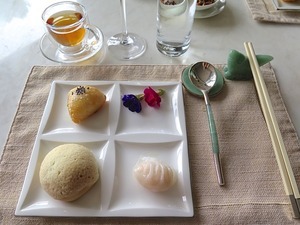 And, um, they serve quite delicious dim sum in business class, how fantastic is that? But it’s good to be home. Am looking forward to the rain this weekend, and tucking into some quality cocktails and pot roast poutine with y’all on my Saturday cocktail tour!